This Little Adventurer sword is full size at 22". It is brand new and comes in a box, supplied with a beautifully inscribed wooden display plaque. The blade is made of 440 stainless steel. 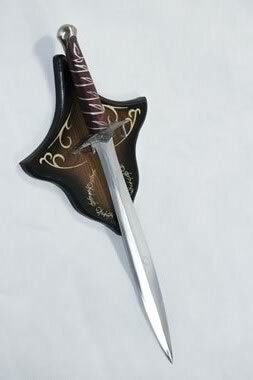 The Little Adventurer sword is light to the hand weighing only 420 grams and a length of 22 inches with engravings running half way down the 440 stainless steel blade. The handle is made from smooth wood dyed red with sliver markings with the pommel and cross guide at either end made of metal. The painted wall mount is made from wood and is 17 millimeters and goes well with the sword. got my sword this morning, over the moon with it, great repl ..